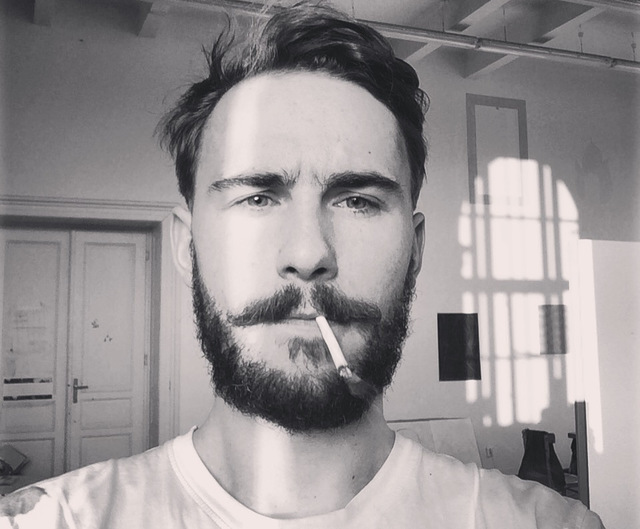 Former street artist David Krňanský is a graduate of the Painting Studio of Jiří Černický and Marek Meduna at the Academy of Arts, Architecture and Design in Prague. He belongs to a group of painters who met in the Studio and together, they have created a unified visual style that is characteristic for one whole generation of authors. It may be formally defined by a typically large, gestural style, distinguishable morphology, and respect for the basic shades of the color spectrum. These forms and ways of thinking are typical not only for David Krňanský, but also for his contemporary or former colleagues from the Studio, Julius Reichel, Martin Lukáč, or Roman Výborný. Krňanský prefers this collective or group work, which is logical due to the similarities in style, and which lost its long-term popularity with the onset of the new millennium. During his studies, he and his colleague Julius Reichel created an artistic ensemble and they work and exhibit together. They have also established one of the most distinctive contemporary artistic groups with a peculiar name, B. H. G. - Black Hole Generation. Their first significant introduction took place at their solo exhibition Pure Hate in the Nevan Contempo Gallery at the break of 2016 and 2017.